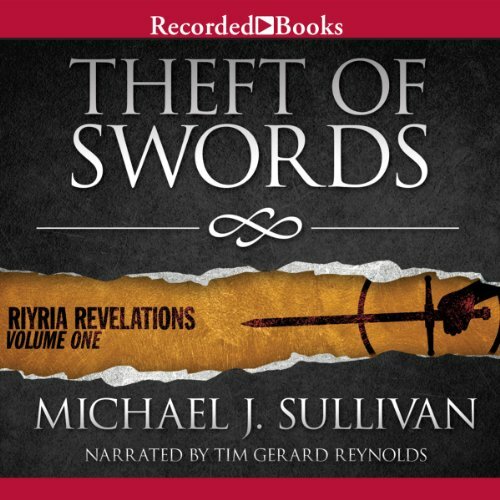 As part of their "First in Series Sale" Audible.com has Theft of Swords on sale for just $6.95. 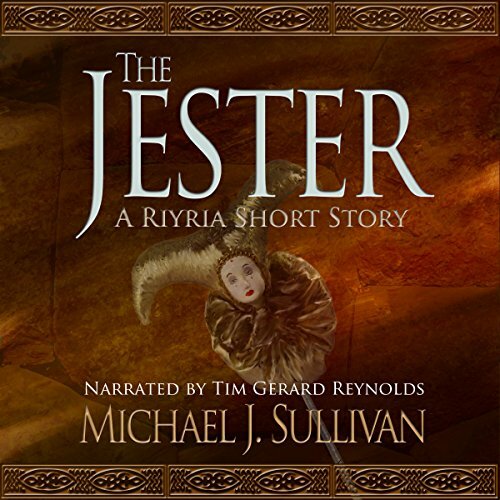 If you haven't started listening to Riyria on audio, this is an excellent chance to give it a try. This volume is an omnibus and so you will receive two full-length novels (The Crown Conspiracy and Avempartha) for less than $3.50 each. But you have to hurry the sale ends 11:59 PM tomorrow (Sunday)! Tim Gerard Reynold's narration really shouldn't be missed. If you're not sure if you want to take the plunge. 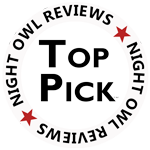 You can check out either of these free short stories. 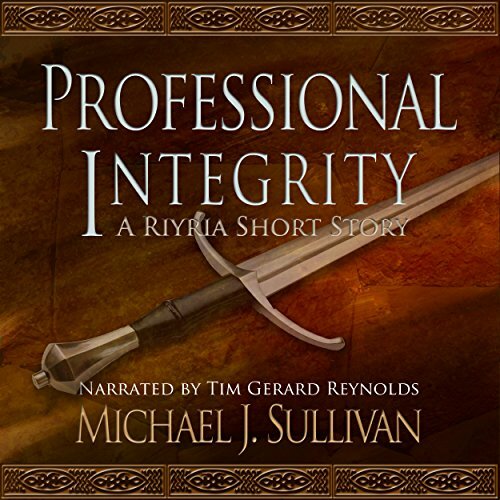 They are a great introduction to the world of Riyria (and Tim as the narrator) so you might want to listen to them first. Each is right around an hour and you can access them by clicking on the covers below. Originally released in the Blackguards anthology published by Ragnarok Publications, this is a standalone short story of 10,800 words (1 hour 18 minutes listening time) . No prior knowledge of The Riyria Revelations or The Riyria Chronicles is required to enjoy it to its fullest, making this a perfect introduction for new readers or a chance for existing fans to spend a little more time with old friends. This is a standalone short story of 7,200 words (54 minutes listing time) . No prior knowledge of The Riyria Revelations or The Riyria Chronicles is required to enjoy it to its fullest, making this a perfect introduction for new readers or a chance for Riyria veterans to spend a little more time with old friends. The Jester is a story of adventure, bonds of friendship, and a recognition that the choices we make dictates the future we find. 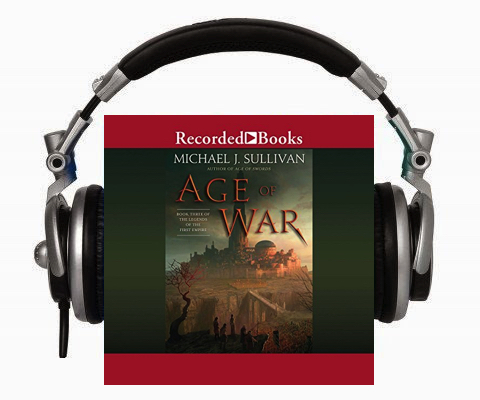 Age of War Audio Recording Begins! On Sunday, Robin and I returned from a little vacation in the Caribbean (St. John was hit last year by two massive hurricanes - one direct hit from a Cat 5 and a glancing blow from a Cat 4 but it's "back" and we couldn't wait to go visit it again). While we were there, we were busily reviewing the printer proofs for Age of War (more on that soon). In addition, we had the recording of Age of War (yes, Tim Gerard Reynolds will once again be doing the narration) line up. Recording was supposed to start on Monday, but it was delayed a few days due some family emergency issues with Tim...thankfully everything turned out better than originally expected. We made it through the first 13.6% so we're off to to a good start. Recording continues in just a few minutes, and it's great to be sitting in on the process. Normally, we would go to New York and be in studio, but with the travel to St. John we didn't book back-to-back travel. We'll let you know how it's going, and in the meantime, if you haven't pre-ordered your copy of Age of War please consider doing so. I can't believe I missed an anniversary!! Luckily it wasn't with Robin, or I'd be sleeping out in the cold. I recently looked back to see when I started my blog and low and behold it was January 9th, 2009, so this post is one month late. Before I was published, or actually just after, no one would listen to my advice or comments on publishing. I didn't blame them because, well, what did I know? More recently, aspiring or newly-minted authors still refuse my advice, but for a different reason. They claim my techniques only work for me because I'm established, and I know nothing about the trials of being an unknown author lost in the wilderness that is the publishing world. Apparently these folks assume I, like Athena, sprang fully formed out of the head of Amazon, fully armored and ready for battle. When I wrote my first post, I was newly settled in Washington, DC, recently publihsed, forty-seven years old, and had just obtained my first iPhone. I also had recently joined my first writer’s group, was playing Fallout 3, and reading Ken Follet’s Pillars of the Earth. My wife of almost thirty years told me I had to start a blog because she thought writing blog posts once a week was just the thing to get me noticed. The Crown Conspiracy is three months old, and I have no clear idea of how well it is doing. This being my first published novel, and not knowing any other published authors, I have no idea if this is typical or disturbing. Around that same time, I read Raymond Feist’s forward to his revised edition of The Magician. In it he wrote, how it marked his tenth anniversary of the book, and how it had been in print continually all that time. 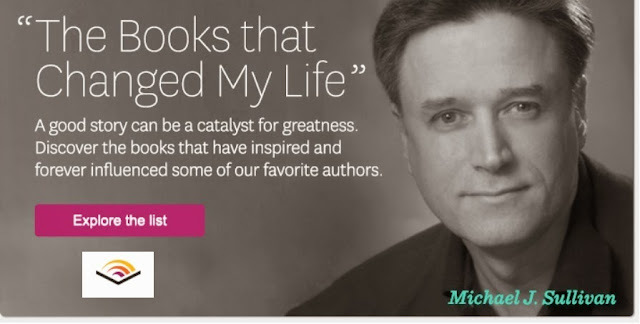 I read his comments about how he considered himself blessed to be a full-time author, and I couldn’t begin to imagine what that might be like. During those first few months I went on a poor-man’s book tour, meaning that I did book signings at all the local bookstores that would have me. Eighteen did. Robin handed out bookmarks advertising my novel outside the front door to the store. Inside, I stood for hours at a desk with a stack of my books, and a sign we had printed up and glued to a foam board. On a good day I sold seven, on a bad day, two. Hello Mike, Two months ago I bought The Crown Conspiracy. Honestly when I bought it I had doubts. (No offence.) I started reading it, and reading it, and reading it, until I was so engrossed in the book that I would stay up at night reading it even when I was dog tired. (…) You probably don’t remember me but I was the teen in the gray sweater who you caught walking out of Borders Express. Mr. Sullivan, This past Saturday I wandered into Border's in Manassas to look around. 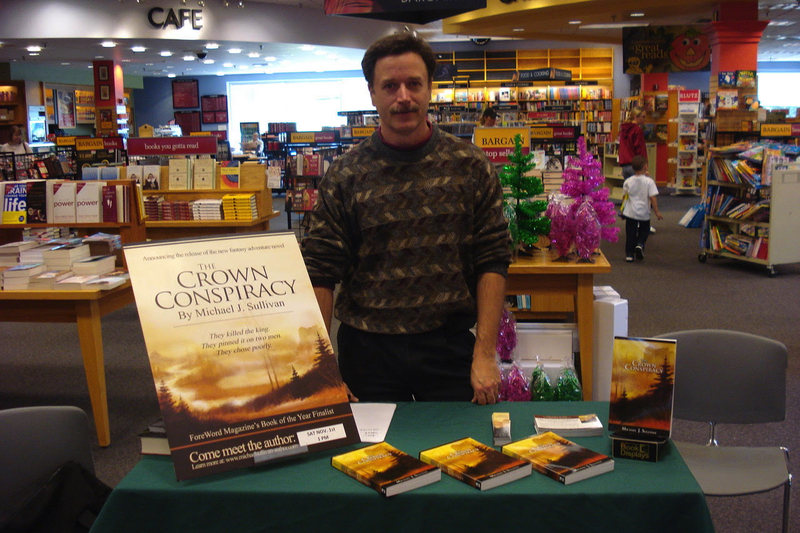 Walking in I received a bookmark for your book, The Crown Conspiracy. As soon as I walked in the store, I noticed you standing at the table to the left and was intrigued. Thank you again for such a wonderful story. Somewhere around that same time, I was online in a writer's forum and ran across some less-than- positive sentiment. My fellow writer wanted to let me know that my books were awful (even though I'm sure he never read them), I was a hack, the entire fantasy genre was for losers, and that in ten year's time no one would know I existed. He went on to tell me that he was a real writer, as evidenced by the fact that he'd never been published because no one appreciates his geinus. Well, the first book of The Riyria Revelations was published on October 1st 2008. So this autumn I'll cross that decade milestone. I’m crossing my fingers that people will still be reading my work, so that, if nothing else, it'll prove that guy was wrong. It doesn't matter that he'll never know because I will. And now, it would seem, that I must take greater care with my posts. While I'm sure the question "Have you read Michael J. Sullivan's books?" will still produce the response of "Who?" more often than any other answer, I suspect that from time to time the reply comes back, "I've heard of him, but haven't read anything yet." There may even be a few times when someone says, "Yes, I have." Hopefully the statement that follows that is "And I love his books." One last thing I should mention...you can probably expect more nostalgic posts as the anniversary draws closer. 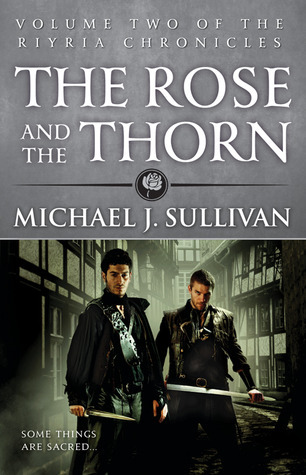 I should also note, that we have finally come to an agreement with Orbit to print hardcover editions of Theft of Swords, Rise of Empire, Heir of Novron, The Crown Tower & The Rose and the Thorn. 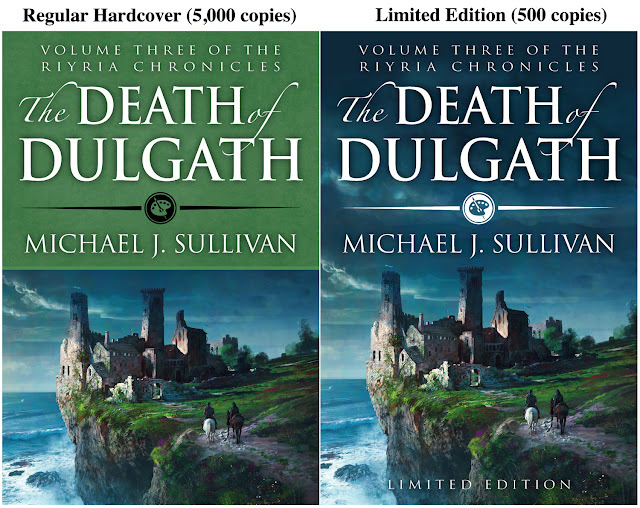 Quantities on those editions will also be limited, so if you plan on getting them (and haven't picked up your Death of Dulath hardcover), then you better hurry or you'll be missing one book in the set. So what's the difference between the two? Well, the biggest is that the limited edition is, well, limited. Only 500 copies were printed, the cover stock is linen with gold foil stamping, the signature page is embossed with my personal seal, and of course they are signed, numbered, and dated. Due to the rarity the limited edition are twice the cost of the regular hardcover ($50 verses $25). If you purchase either edition from my store you can have them signed and/or dedicated. I'm thrilled that we sold out, or nearly have, the print run for this book. Usually a self-published book utilizes print-on-demand technology, and that can make the unit costs really high...too high to offer economically in bookstores. But due to the Kickstarter, we were able to use a distribution partner and that meant getting the books into bookstores, which certainly helped it sales. I do hope you'll be able to grab one of the remaining copies, and as always thanks for your support. Revising Age of Legends based on alpha feedback and getting it ready for a beta read. And up until recently I was starting work on my new series. Which now has a name. No, I can't tell you what it's about. Well, I could, but then I'd have to kill you, and tracking everyone down would be quiet time consuming. What I can say is this new series falls between Legends of the First Empire and The Riyria Chronicles. I'm about 50,000 words into it so far, but for now it goes back into hibernation because others I was waiting on (Del Rey for production work on Age of War, and Robin for alpha feedback on Age of Legend) have moved their balls back into my court. The good news is I did wrap it up in a nice stopping place before returning to Legends of the First Empire. So it's sitting there all safe and sound. Oh, and one other thing this book has besides a name; it also has a page on Goodreads. If you add it to your shelf, you'll see updates from me as I'm working on it. That way you won't have to ask me what I'm doing...you'll already know! Added The Disappearance of Winter's Daughter: Previously you could only order this title from a "special site," but now you can get copies directly from our store. Due to a non-compete clause this book (in ebook and print) won't be in the retail chins until June 2018, but if you buy direct from our store you can get your copies now! Added the mass market paperback edition of Age of Swords: Yesterday was the release of Age of Swords in mass market paperback format which means (a) the price on the ebook has dropped and (b) your can now order either hardcovers or paperbacks directly from us. And of course you can get them signed and/or dedicated if you wish. Grouped the books by series: Previously we grouped the page by the "type" of book: ebook, mass market paperback, trade paperback, hardcover, or limited edition hardcover. That made it easy for creating the page, but it wasn't always intuitive for ordering the books. We have now broken the page by each series and the books in those series. You'll notice that some books don't have the ability to purchase an ebook, that's because they are traditionally published and the right to sell the digital copy is reserved to the publisher. We can always sell print books for any edition that is in print. Age of War pre-orders: Are not currently in the store, but we will have a "secret page" that you can preorder from once we get closer to release. If you want to be notified when that page goes live, here is a link to the signup page. Once the secret page goes live, we'll email you. Speaking of "books in print," the hardcover editions of The Death of Dulgath are now officially sold out, and there's less than 100 copies of the trade paperback edition. There won't be a reprint for the hardcover so once they're gone, they're gone. We do have some copies here, and are selling them on a first come first serve basis. We also are dangerously low on the LIMITED EDITION versions of that book as well, so I expect those to go out of print soon. As for the paperback, we won't be doing another printing, but we will offer the book through print on demand. This will make it a tad more expensive and the book will be slightly taller than all the other Riyria trade paperbacks. I know a lot of people like their books in a series to line up perfectly, so if you're one of those people, I'd suggest ordering a copy of those from either our site or your local retailer. I hope you'll check out the new store, and if you see something you like go ahead and order a copy. We are through the shipping rush that included a ton of pre-orders and the Kickstarter books, so shipping is going much more smoothly now. And please let me know if you have any problems. I did extensive testing, but that doesn't mean I didn't miss something somewhere.